There are many reasons why we need to pay attention to frost and freeze protection of plants. . In fall, we want to stretch to season, gathering those last tomatoes and peppers. In winter, we have to protect our greens, citrus, and tender perennials from arctic blasts. And in early spring, we want to get a jump on the garden, but we have to be prepared for a late freeze. And always, we want to grow tropicals, even if they really shouldn’t be here. Frost, Freeze…Snowpocalypse! ; a few definitions Although true tropicals can be harmed by merely chilly temps, we are usually only concerned when temperatures approach freezing. A “frost” means the temperature will be 32F or lower. Frosts are usually brief, spanning the hours just around dawn. Extremely tender plants can be damaged by a frost. We usually define a “freeze” as temps of 27F or below. Freezes vary greatly; the ultimate lowest temperature, the number of hours below freezing, and the number of nights the freeze continues are all factors that determine how severe a freeze will be. Frost protection begins with proper site selection. Even the smallest property will have micro-climates, areas that because of the slope, exposure, and orientation are warmer (or colder) than surrounding areas. Remember that cold air settles to the lowest area, and that the coldest, most damaging winds blow from the north. When choosing a location for tender plants, look for spots sheltered from the north wind, on a slope so that cold air will drain away. The south side of buildings and tree lines are often good areas. Areas under tree canopies, and near bodies of water, can have a substantial temperature advantage. How much protection a plant requires depends on many factors, mainly, of course, what plant it is. Vermont sugar maples gladly spend the winter covered in snow, while papayas will croak before it even gets frosty. The age and size of a plant can affect hardiness. Young citrus and figs, for example, are much tenderer than older, larger trees of the same variety. Another important factor is the hardening process. Plants exposed to cold undergo changes which allow them to survive low temps, a process called hardening. A plant which has been exposed to many weeks of progressively lower temperatures will be much better able to survive a freeze than that same plant without prior hardening. This is why sudden early fall freezes can be so damaging. Similarly, a late spring freeze after a prolonged warm spell can spell disaster. New growth, flower buds, and fruit are more susceptible to cold damage than the rest of the plant. Knowing your plants natural hardiness, and its state of hardening, will determine how much protection it will require from a frost or freeze. Before the Freeze Begin to prepare for cold weather early. The afternoon before an Alberta Clipper sweeps down is not the time to be looking for frost cloth. Gather you materials, build your structures, make your plans, and be prepared! And implement your plan; when it comes to frost protection, better safe than sorry is the rule. We have never really regretted covering for a freeze that wasn’t as severe as we anticipated, but we have really regretted thinking we could skate by without covering. When cold weather is anticipated, water plants well. Dry plants are less able to withstand the additional stress of cold weather. 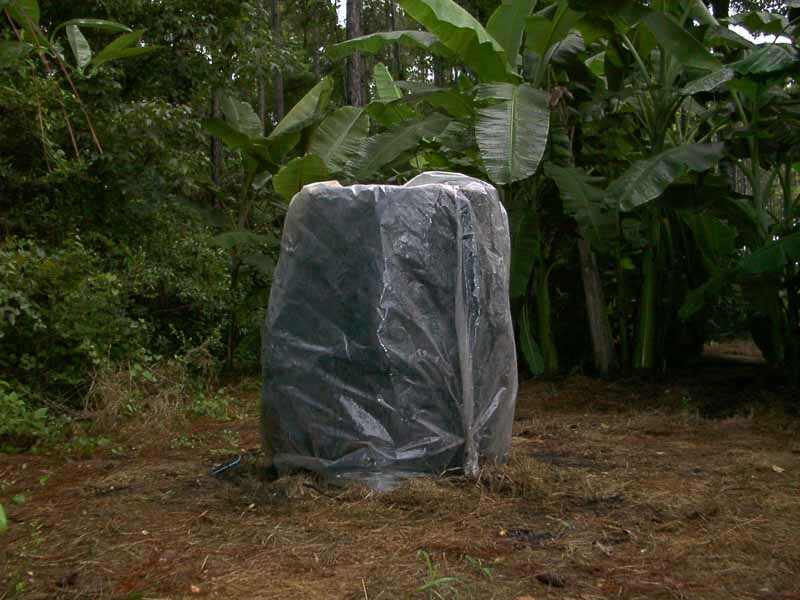 Basic frost protection begins with simple coverings. Small plants and tender veggies can be covered with hay or pine straw. Tender evergreens like Sagos, Camellias and Azaleas that have tender buds, veggies, and winter annuals can be covered with sheets, tarps, or commercial frost-cloth to protect them from frost damage. For deeper freezes, use plastic over the fabric covering. Always use 2 layers; fabric on the inside, plastic on the outside. Do not let plastic touch the foliage. Extremely tender and/or valuable specimen plants may be best grown in containers. Then they can be moved inside, either into a greenhouse or sunroom for the winter or just into the house or garage when cold temperatures threaten. Container plants can also be laid over on the ground, and then covered. Larger plants, such as mature citrus trees, require greater measures. Simple structures, either temporary or permanent, can be used to support the 2-layer covering, in effect building an individual greenhouse around the tree. If you can’t, or don’t want to build a house around a tree, you can bank up around the trunk with a pile of moist sand. Make sure your graft union is covered; this will prevent the loss of the grafted part of your tree during a severe freeze. Simple structures are a great way to extend both the length of the season and the range of plants you grow. Although you can certainly spend big bucks on a greenhouse, it isn’t necessary. A cold frame is a simple box set on or into the ground and covered with glass or clear plastic. Cold frames are great for overwintering tender perennials and starting seeds early for the spring garden. Greenhouses can be built very simply and cheaply. Any structure that is strong enough to hold up plastic film, and not blow away in a winter storm, can be a greenhouse. We use PVC pipe to build hoop houses, and they have served us well for years. Lean-to structures built against the south wall of a building work great. Be sure to get the real greenhouse grade plastic film to cover your house. Hardware store plastic will usually not last the winter before the sun destroys it. Fill your greenhouse up! Pots full of wet soil have a lot of “thermal mass”. All day long they absorb heat from the sun, and all night they radiate it back, keeping your greenhouse warm. Eventually, however, you may need additional heat. Lightbulbs, heat lamps, electric or gas space heaters, even Christmas lights (the old-fashioned C-9 ones) have all been used. In our hoop houses and citrus grove, we use water. We turn on the irrigation and basically pump warm water into the structure all night long. Note that we are not “icing” the plants as is done in groves in South Florida, rather we are spraying warm mist down low. Using water and the 2-layer system, we have held fruit on our citrus trees through extreme freezes into the single digits. Lastly, be ready to uncover your plants. As the Sun comes up and temperatures rise, damaging heat and steam can build up under plastic coverings. Even if freezing temps are expected again the next night, tree covers and greenhouses may need to be ventilated during the day. Got a question about how to freeze protect your plants? Drop us a question in the form below. We’d love to help you.